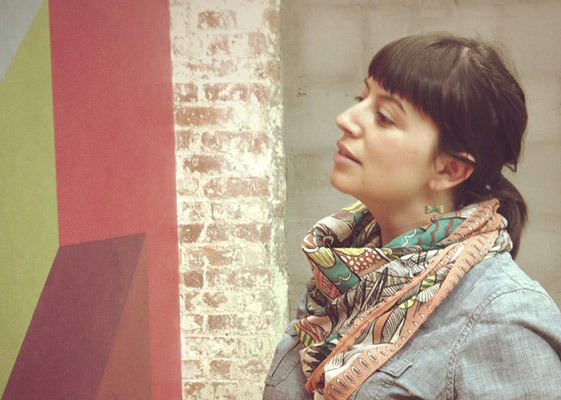 Five weeks remain for my exhibition on Buy Some Damn Art. There’s still time to add to your library! 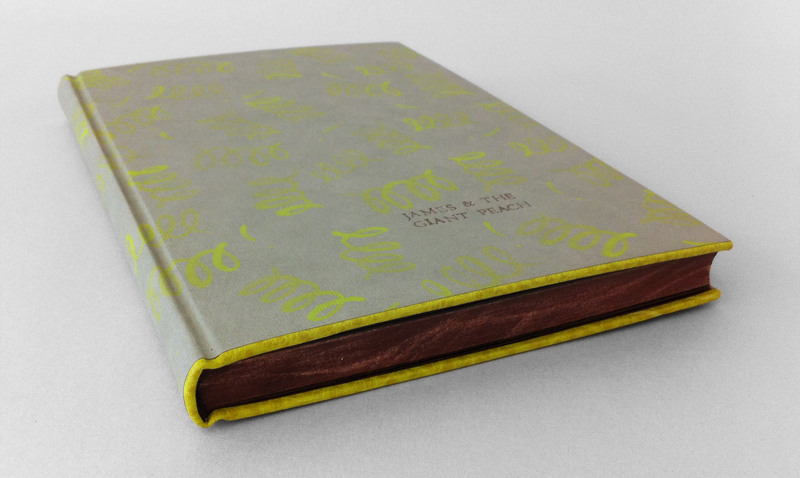 Initially for this binding of Roald Dahl’s James and the Giant Peach I had intended on covering it in a peachy-colored pig suede to represent the Giant Peach itself. However, dressing the book up like a peach felt too dry, too safe. The story of James and the Giant Peach is loaded with magic from the overgrown peach to the singing insects, which only became possible through the power of those little, luminescent crocodile tongues. Using smoke Hahnemuhle Ingres, I created a simple paste paper representing the little green things, scattering them about randomly. The acrylic paint was mixed with wheat starch paste and watered down significantly, this allowed for the graduation of intensity with each corkscrew shape. I choose to execute this design as a Rubow Millimeter binding. This is one of my favorite structures to work with, mainly because the covering material (most commonly paste paper) can lay across the entire book uninterrupted. The head and tail edge of the boards are lined with buffalo skin in Anis (chartreuse green), which matched perfectly to the green tone on the paste paper. The edges of the book were painted with an fluid acrylic/paste mixture to match the red walnut Cave Paper endpapers. After application and once the pigment was dry, I used sandpaper to scuff up the edges a bit giving it a distressed look. The headbands are hand sewn around a single core (bead on foredge) in alternating dark brown and reddish brown. The title was hand stamped through brown foil. 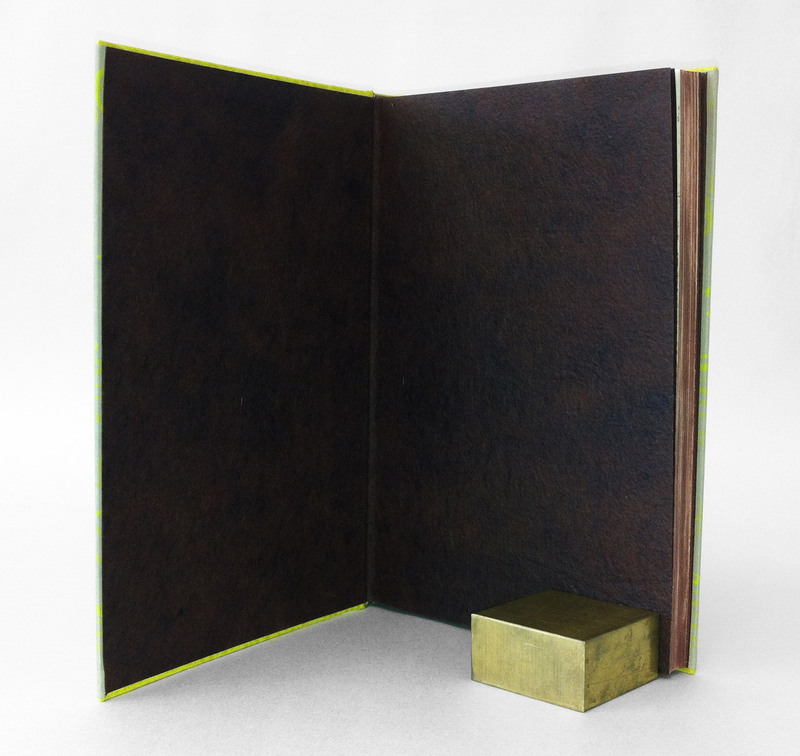 The book is housed in a clamshell box. The trays are covered in smoke Hahnemuhle Ingres and lined with lime Moriki; the case is covered in a brown Canapetta bookcloth. 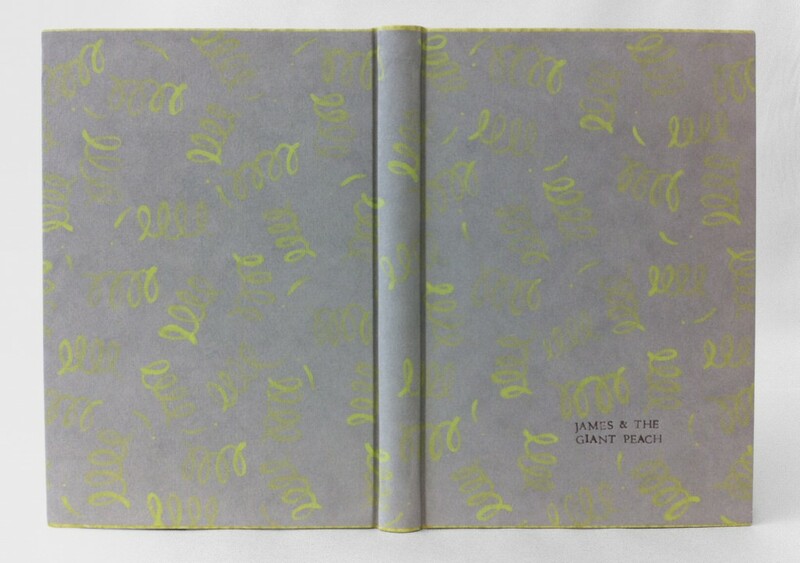 James and the Giant Peach is for sale at the price of $400.